In many countries today, children are fascinated by karate and eager to learn this ancient, artful form of self-defense. Youngsters with cerebral palsy share this fascination with karate - but rarely have a chance to learn it. 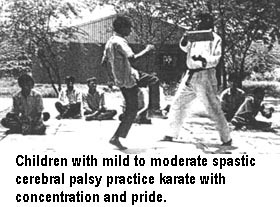 In The Spastics Society of Tamilnadu (SPASTN), an innovative program in southeast India, children with mild to moderate cerebral palsy are taught karate. They take it very seriously. Likewise their trainers, who are volunteer professional karate instructors, take the children and their learning seriously. 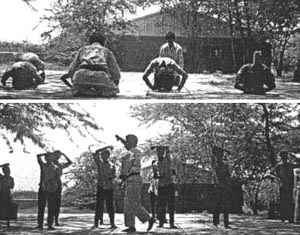 At its best, karate is a physical art which teaches its disciples self-mastery of body and mind, as well as a philosophy of harmony and non-aggressive self-defense. 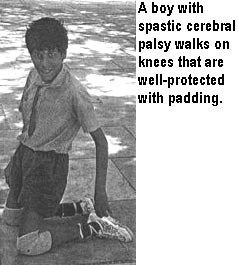 Its guided rhythmic movements conform with many of the therapeutic movements and positioning used for children with cerebral palsy. Seeing these children proudly demonstrate their karate skills is a mind-altering revelation, even to those of us who work routinely with disabled kids. It awakens us to the children's hidden potentials. We learn that, when they are challenged with an activity that they passionately want and choose to do, it is astonishing what they can accomplish. Observing their concentration and unexpected grace as they perform this ancient art stretches the boundaries of what therapists, care-takers, and the children themselves dream is possible. For doer and viewer alike, it is a liberating experience. The karate program at SPASTN was initiated by karate master Shihan Hussaini, who is also trained in social work and guidance counseling. The parents are delighted with the results, and teachers are amazed. Observable,benefits are many: better coordination (both gross and fine), improved behavior and attention span, and a greater sense of personal adequacy, positive self image, feeling of fulfillment, and self-confidence. 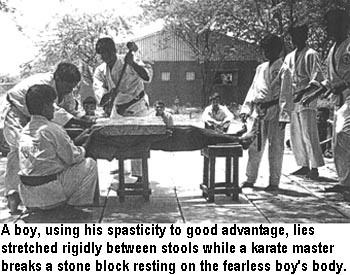 In addition to karate, the SPASTN Center assists children with cerebral palsy to expand their capabilities. 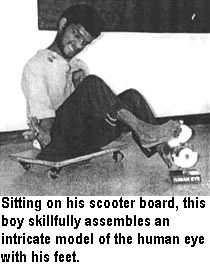 Rather than trying to "normalize" disabled children to do things the same way non-disabled children do them, they help children learn to do things in whatever way is easiest and works best for them.